As a custom builder, I’m going to work with you to build something that is uniquely yours. I really derive a lot of my satisfaction from meeting a customer’s vision for thier unique creation. When you leave it up to me, I’ll build something great, but there’s that little tinge of loss that I feel. First off, know what kind of instrument you want, that get’s us in the same ball park. But then let’s get the budget out of the way right way. I can do things to price point, and I’m good at it, but please don’t make me quote out the best of everything when you know your budget won’t accommodate it. Gimmie a target, we can always upgrade from there. Next you’ll need to decide on a primary wood, generally maple or mahogany. If we’re building something special, we may pick out an accent wood that is highly figured. This can be anything from Spalted Maple to Curly Redwood. 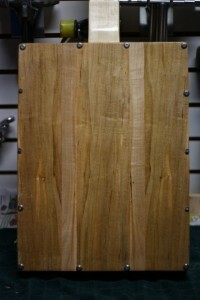 I love using great wood and work with some suppliers that can get some special things for not a huge ton of money. 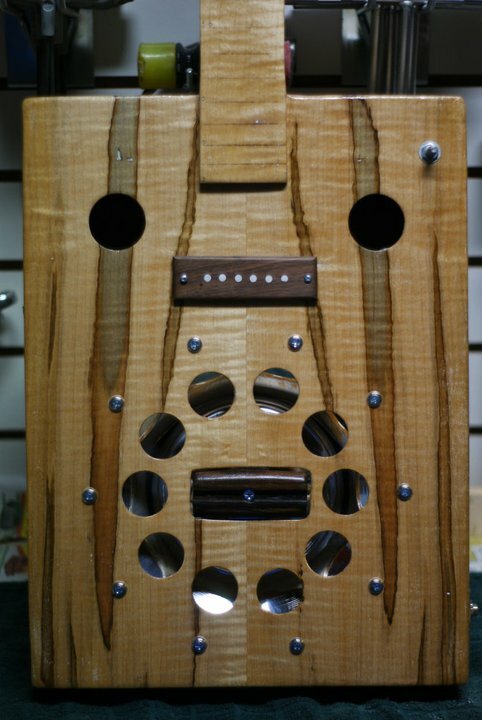 However, be aware that a nice set of matched wood can cost in excess of $100 by itself and can add significantly to the cost of your instrument. 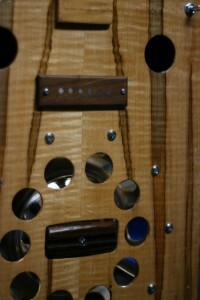 Aside from wood, electronics are the second most costly component in a build. For example, a regular old gibson-branded humbucker can cost $120 by itself. I can get you an inexpensive import humbucker for $10, but that’s probably not what your looking for either. 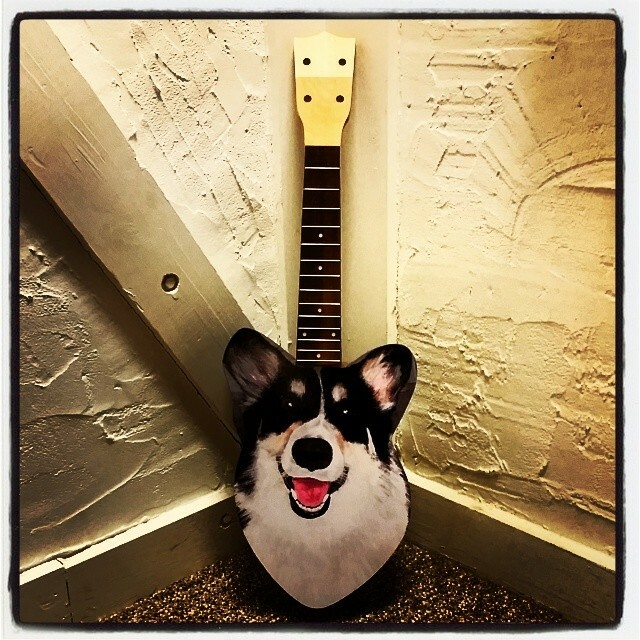 I’ll work with you to determine the sound your looking for and match that to an artisan builder like Randy Bretz, Ted Crocker, Bob Harrison, or Elmar Flatpup that will make some thing that will match the character and sound you’ve got in your head. Finally, we’ll round out the hardware, bridge, tuners etc, to meet your budget and playing preferences. It may take an hour or two to get the details right, but it’ll be worth it. Build times run 6-8 weeks, i know that’s a long time, but this is a hobby business i do in my spare time and I price it accordingly. I do promise to keep you informed on the progress of your build on a very regular basis. My preferences in music and playing styles have always leaned towards the earlier versions found in the genre. When I listen to punk, I like old punk. Reggae = roots, blues was born in the delta, etc. I’m also a huge fan of slide style playing both lap-style and bottleneck. 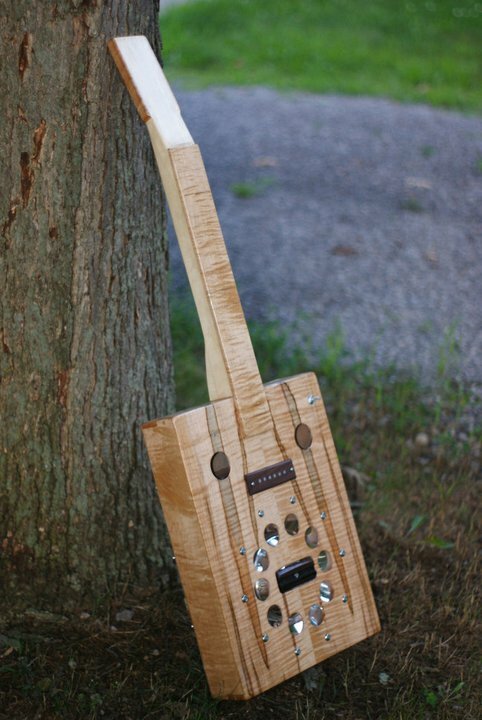 Now that I’m building instruments, it’s only logical that I take that same roots-based approach. However, doing customs are my favorite, write me a note and let me know what you’re thinking and I’ll let you know if I want to do it and how much it will cost. Guitars can cost as little as $250 but can go up significantly based on materials and labor and can take between 6-8 weeks to finish. And for those facts alone, sometimes they are the best option. However in these situations, I must insist that all piezo elements, both disc and rod varieties be used in conjunction with a preamp or preamplifier. Most amplifiers with the exception of a relative few designed specifically for piezo equipped “acoustic” instruments, are designed for a range of impedance (resistance) of a magnetic pickup. The impedance of piezo discs are comparatively much lower. This leads to a mismatch between what kind of signal the amplifier is designed to handle and what it is being given. The result is that thin and brittle sound that I’ve come to resent with such fervor. The solution is to use a battery-powered series of capacitors to buffer the output of the piezo element to be closer to what the amplifier is expecting. This is also known as a preamplifier. While these devices won’t completely eliminate the sound characteristics that are inherent to piezo elements, to my ears they are least make things tolerable, and are thus required equipment. 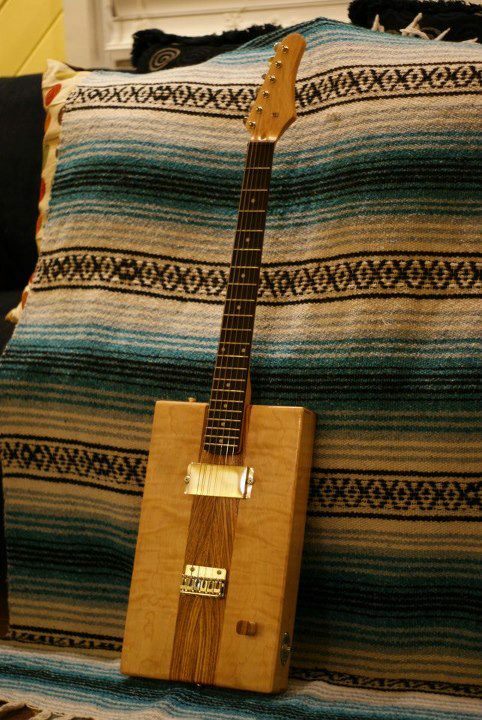 For those reading that are dedicated to the cigar box variety of instruments, you could argue that it’s a cigar box and it’s only going to sound so good no matter what. To a certain extent you are right, but there is a difference between lo-fi and bad. The addition of a preamp isn’t going to change the character of the sound, but it will go a long way to controlling the frequencies that lead to listening fatigue. 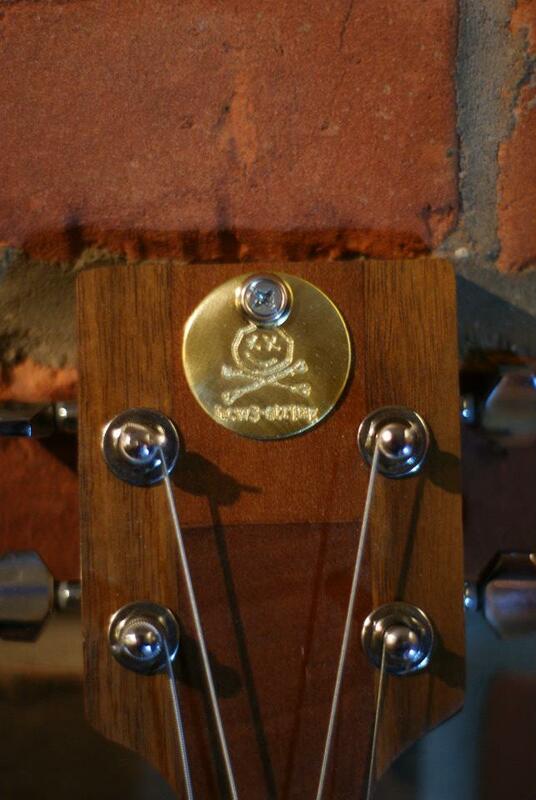 In case you didn’t check out the pics of the new guitars, I’ve started using a small brass medallion to brand my guitars. I’ve always felt kind of weird about branding, somehow thinking that my “style” was enough, but who am I kidding? it’s a branding world. I hope you dig it. This is a fun little 19″ scale instrument tuned GDGB at the moment but i may try it in 5ths GDAE like an octave mandolin. Brian Romero made the cones, bridge and cover for this one and he really did a great job. 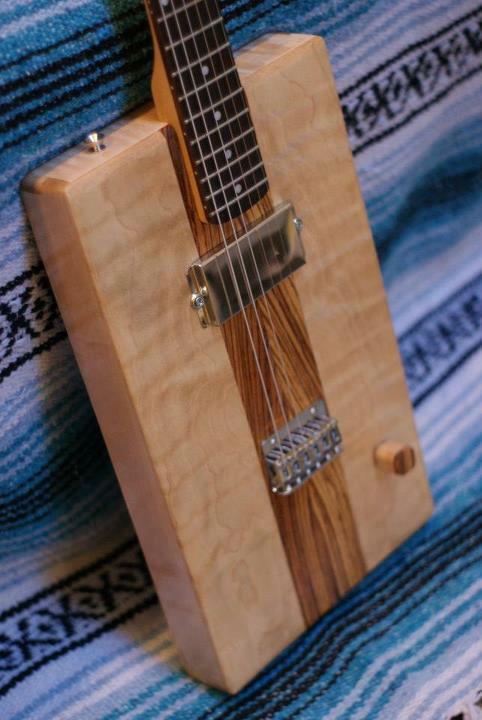 Dan Sleep at Humidor Guitars did the fretboard, OLd Lowe tail piece, and that’s a Bob Harrison deco rail pickup. The back is some of the great old growth mahogany from Pete Lynch, the top and neck are more common Honduran mahogany. I did a v profile on the neck and the action is pretty low and even on this one. These are a couple basic 15″ concert scale ukuleles that are going to some service members in the 43rd sustainment brigade. I have to admit they are pretty fun but aren’t as loud as my ghettoshorty ukes. There is some novelty value to the cigar boxes though. If you would like one of these, I’ll make one for $100 plus shipping. Better yet, buy one to donate to a service member. I’m turning 40 this year and some days there seems to be some doubt as to my ability to walk when I reach 50. 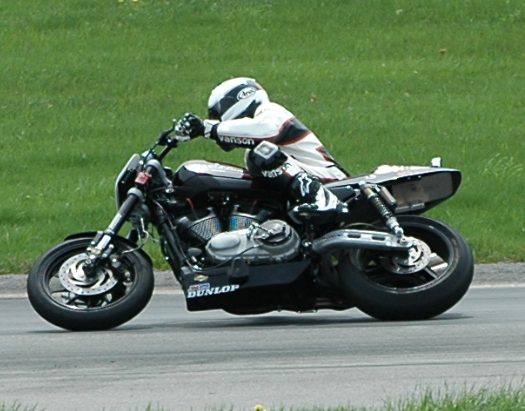 Yet a good friend of mine, Greg Hutcheson, is returning to professional motorcycle racing north of 50. Thanks to Wes Orloff at WFO racing, Greg has the use of a beautiful Harley Davidson xr1200 that he will be campaigning in the xr1200 AMA spec class this season. Greg was a professional racer earlier in his life before a horrific crash at Daytona cut his dreams short. I think it’s an awesome testament to his love of racing that he has no come full circle. Needlesss to say, racing is super expensive. If you’ve ever wanted to be part of a great of come back story, here’s your chance. the donate button below links to his racing effort. What is Scale Length and how does it affect fret placement? Scale length is simply the distance between the bridge of the instrument and the nut. It represents the part of the string that vibrates which is sometimes referred to as Vibrating String Length or VSL. Your total string length is a fairly inconsequential measurement beyond the geometry of string angles approaching the nut and bridge. On a western chromatic or diatonic fretted instrument, scale length determines fret placement. With the 12th fret position being exactly the half way point between the nut and bridge and one octave higher than the open note. For a complete explanation of intonation on a fretted instrument, please see my article Intonation for Everyone. 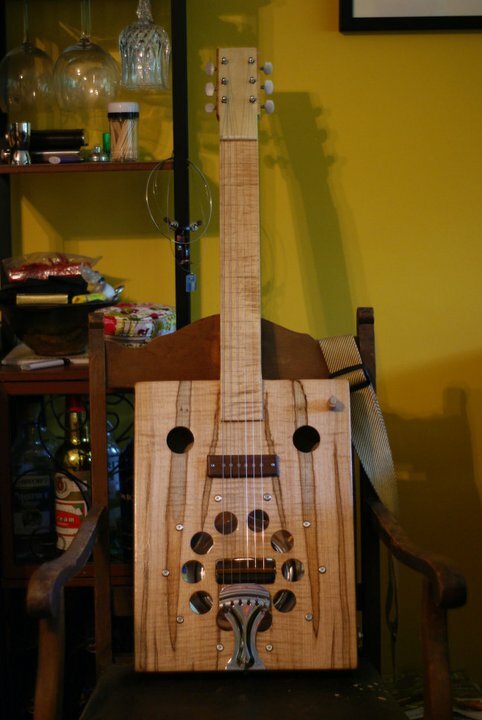 The remaining frets above or below the 12th fret are on a graduating scale, and the shorter the scale length the closer the frets are too each other. While there are formulas you can use to mathematically figure out fret placement, it’s much easier to use a computer program. I use a free program called wfret. You can download it here. Most guitar manufacturers use the same scale length on most of their instruments. Fender uses 25.5″ lentgh where Gibson uses a slightly shorter 25″ scale. Martin uses a more esoteric 25.34″. However, many import makers use metric scales that are close to 25″ mark but my not be exact. An easy way to reverse engineer scale length is to simply measure from the nut to the 12th fret and double that measurement. 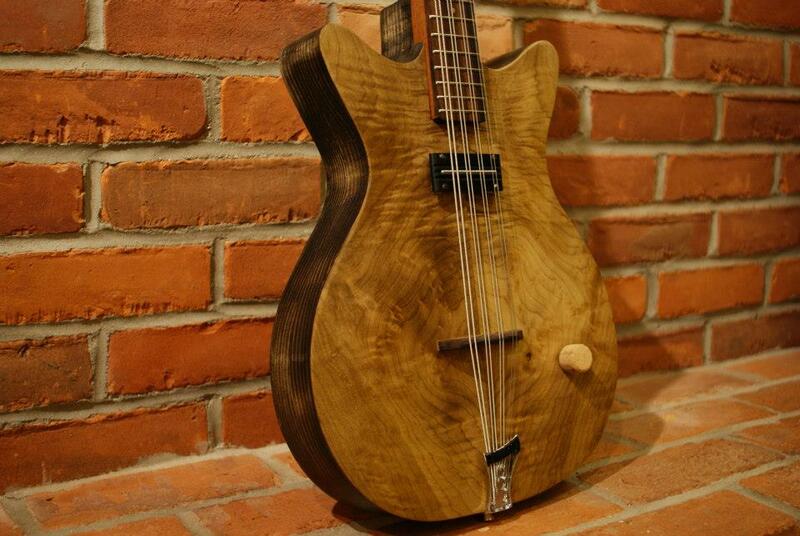 For example if the measurement is 12.5 from the nut to the 12th fret than the scale is 25″. When designing an instrument, You should decide the scale length first as it will dictate bridge and fret placement that will be critical in the overall layout of your instrument. To long of a scale and the neck could be heavy and out of balance to the body, to short and you won’t be able to play on the upper frets. 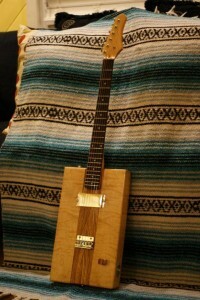 If your building a box guitar a yard stick can be handy tool to give you the feel of what scale length you should use with a given size box. I’ll consider trades dollar for dollar, and I’m not opposed to kicking in cash for something that is a pending purchase for me anyway. If you’re local, I’m also in need of some landscaping help, as well as some remodel assistance. Cash-free economy works if we both have something the other “wants”.